Ask any Connecticut wedding photographer and they’ll tell you that a large percentage of your wedding photos comes from how well you pose. You can, of course, get a good wedding photographer to help bring out the x-factor that makes your photos pop. However, if you do the poses wrong, it doesn’t matter how good the photographer is. It’s understandable if you don’t know all the best poses to look fantastic in photos. After all, not everyone is a model and you’re probably not accustomed to being in the presence of a camera for many hours at a time. That said, the idea of having to go through thousands of photographs on your wedding idea can be a tad frightening. I’m going to give you a few tips on how to pose for your wedding photos and achieve a relaxed, natural look that will give you photos you’ll be proud to have in your album. Your face isn’t symmetrical. Now, both halves are definitely beautiful. However, there will always be one side that’s a lot more beautiful than the other. Your first mission should be to look for that side. You can get a friend to take plenty of pictures of you with your face tilted in either direction in order to find your best side. Once you’ve find it, make sure you always show it in photos. Have you ever noticed that pictures taken while looking straight into the camera aren’t always that great? That’s because such photos get rid of the shadows that help to define the contours on your face. You should aim for a chiseled look by tilting your chin either up or down and turning your cheek to your best side. This will give your face the perfect contour. You might want to achieve a few things in your photo, such as your face and body looking slimmer overall. This all depends on the natural proportions of different parts of your face. If you have a rounded face, tilting your chin downward will help to make your face look slimmer. If you have a particularly large forehead, it helps to lift your chin ever so slightly. Tilting your face slightly forward so it’s closes to the camera also helps, as it will overall make your body appear slimmer. Try to smile the way you would in real life. Many people make the mistake of giving too large a smile. In real life, you open your mouth slightly and your face is relaxed. A smile that is too large is usually easily identifiable. The cheeks get puffy and your eyes are too squinted. It definitely won’t look very nice. You should also strive to smile with your eyes. A real smile reaches your eyes, making their corners wrinkle slightly. The corners of the eyes also turn up and you will find yourself looking up slightly. Achieving a genuine smile shouldn’t be particularly difficult. Just think of something that makes you particularly happy, such as the fact that you’re going to spend the rest of your life with the love of your life. Don’t put your arms too close to your body because that will make look wider than they actually are in the photograph. You can also put your arm on your hip in order to draw attention to your waist and make your arm look slim. Just make sure the elbow points behind you rather than to the side. Alternatively, if none of that makes you feel comfortable, you can hold your significant other’s back so your arm is hidden altogether. Your legs can be a great prop to make your photos look stunning. Bending a knee helps to take the look of stiffness away from your pose. You can even cross your ankles, which will help your legs look longer. You should stand at an angle to the camera in order to put more emphasis on the depth of your body. Taking a straight-on shot isn’t always a flattering look. In this case, a 45 degree angle would be perfect. Standing up straight can do wonders for your pose. It makes you look a lot more fit and confident. It also enhances your mood and makes your pose more natural. You should also relax and have fun. It’s your wedding, not an audition for a modeling agency. The best photos are usually the ones where you’re not trying too hard. As a Connecticut Wedding Photographer, I have experience a variety of spectacular wedding venues and unique celebrations. Some of the best pictures that come from being a Connecticut Wedding Photographer are those that involve the smaller moments before the ceremony and receptions. This picture shows one of those precious moments. The black and white photograph could be from any year or place, an image that is truly timeless. The image was taken at the childhood home of the bride, while she and her bridesmaids prepared for the events of this special day. Inside, the bride and her maid are being primped for the celebrations. The rooms of the house are bustling with girls running from room to room to get makeup painted on and hair done up in elaborate curled styles. The interior of the house is bustling with energy and laughter as the ladies within make ready to join the bride as she becomes a wife. The outside of the home is serene, a quiet scene compared to the joyful chaos held within its walls. 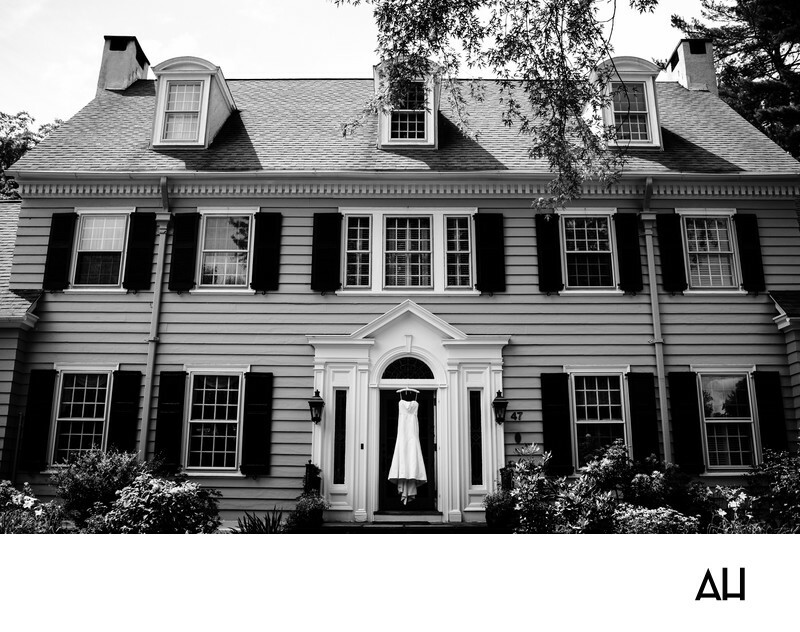 Hanging from the dark black front door of the Connecticut home is the bride’s gown. It waits for her patiently, ready for her to step over the threshold and outside to begin her journey to the church. The gown is a lovely white, strapless dress. The dress is simple, yet incredibly elegant, with a train of fabric that flows down toward the ground. It stands out boldly against the dark color of the door, an image of anticipation for the celebrations to come. The house has held the memories of the bride’s childhood and now will forever hold the memories of this day.